First things first. I would like to offer my thanks to that very fine chap and all round good guy Kaptain Kobold for the inspiration to fight this action - despite the fact that it is on hexes and with larger armies than perhaps he envisaged the rules being used for! This is the first game I have fought this year and to be honest, I was really undecided what to do. I have some ideas for some 1914 based games but nothing tangible planned just - and this will form another post in due course - when I came across the good Kaptain's recent post. I know absolutely nothing about the Mexican adventure but what intrigued me was the 'quick and dirty' rule set he 'Kobold' together based on Battle Cry. I was so intrigued in fact, I copied them and decided on the spot to fight an action using them. 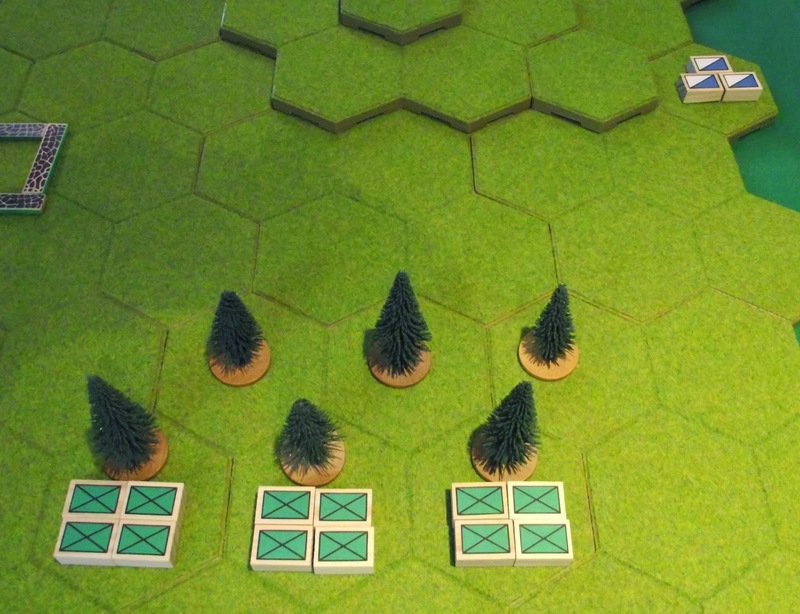 This was a very simple set up - both sides equally balanced with 7 x 4 strength point infantry units, 2 x 3 strength point cavalry units, 2 x 2 strength points artillery units and 1 x 1 strength point commander (12 units in all and using a 13 x 9 hexed playing area rather than the Kaptain's 8 x 8 squared grid). This meant a total of 39 strength points with an exhaustion level of 19. 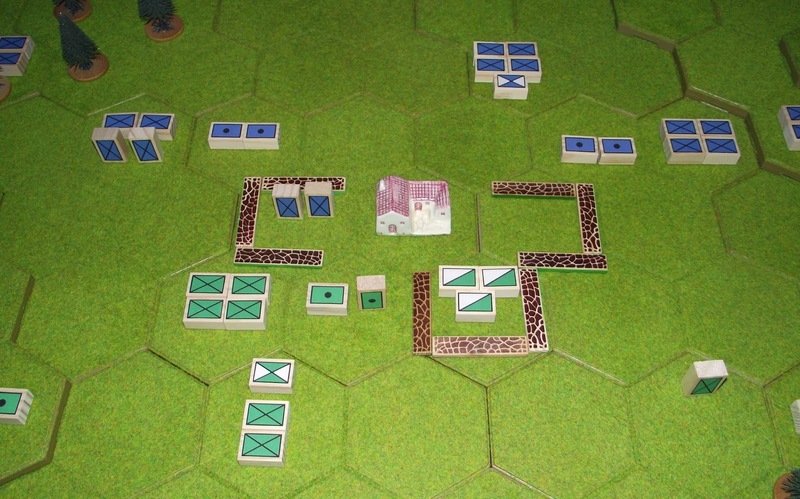 Inspired by the good Kaptain's idea around initial deployments (he did not mention how he got to the starting positions but I will) I rolled 12 x D6 per side with scores of 1 and 2 starting on the four left hand hexes, 3 and 4 in the central four hexes and 5 or 6 in the four right hand hexes. The initial dispositions with the Russians on the left and the Turks on the right. Note that neither side had any great strength in the centre - the dice gods rolling an impressive amount of 1s, 2s, 5s and 6s. The Russian right - safely deployed behind the small wood. Turn 1. The Turks have moved up on their right and the Russians respond by sending a cavalry unit to scout the suspected enemy position. Turn 2. Whilst the Turks traverse the woods the Russian cavalry charges the enemy horse and and drives them off. Turn 3. Retribution is swift as the Turkish infantry left fly at the Russian horsemen, emptying many a saddle and destroying them as a fighting force. 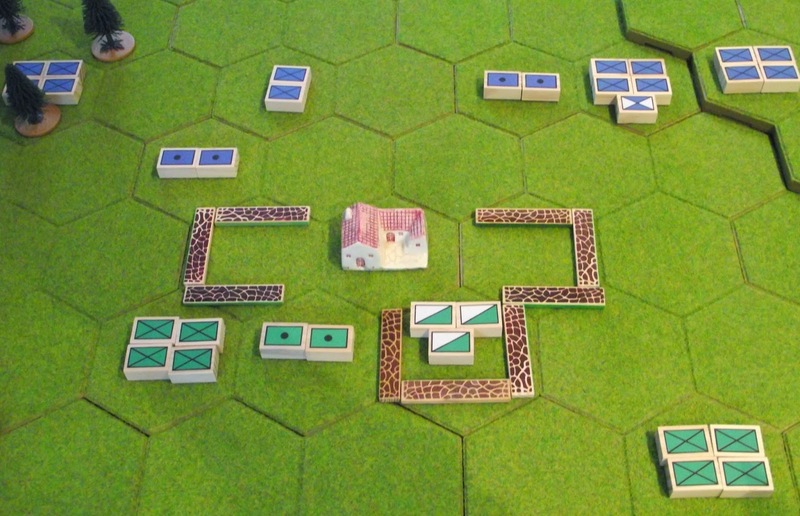 In the face of this setback the other cavalry unit retires to the rear of the rear of the hill behind the deploying artillery. At last the Russian guns arrive and deploy at the top of the hill, overlooking both the farm and the advancing Turkish infantry. Turn 4. 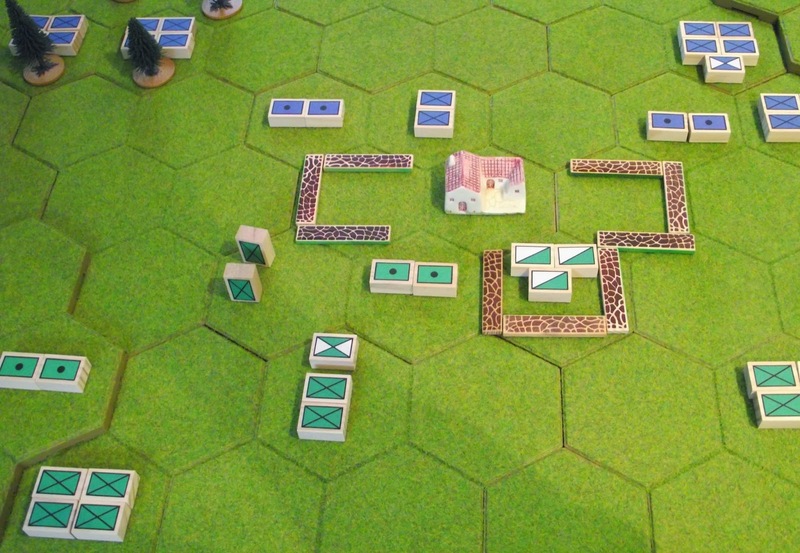 The Russian artillery opens fire and immediately causes casualties on the sole Turkish infantry unit in range. The Turks appear to be in no hurry to close the range whilst the the rest of the Russians move up. Turn 5. 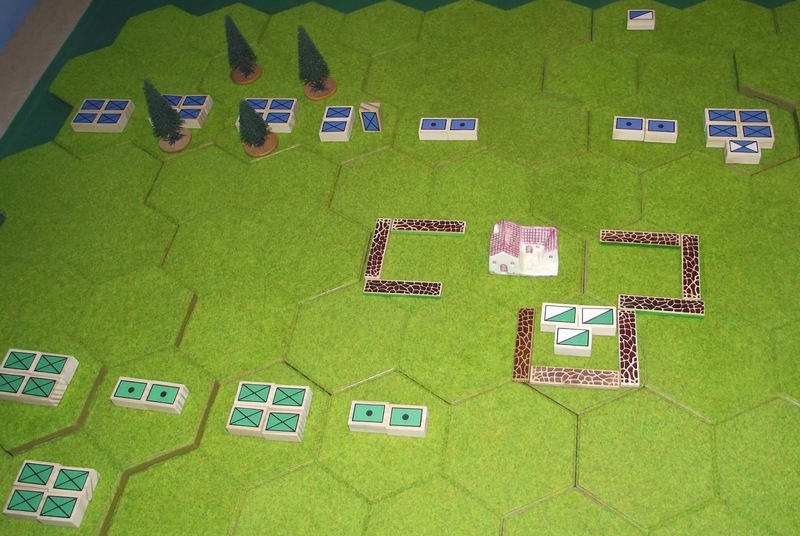 In a bold move the Russians send a scratch force of cavalry and artillery to occupy the farm whilst their infantry struggle to move up in support. The Turkish approach is both cautious and methodical. Turn 6. 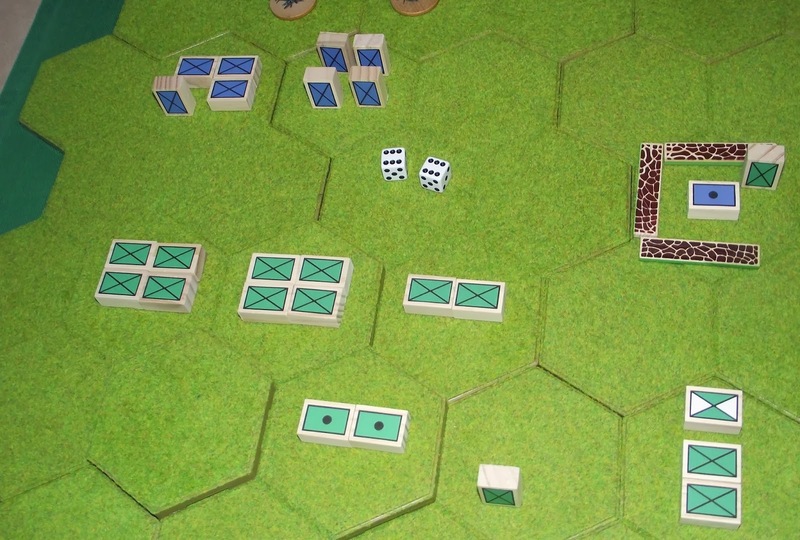 The Russian cavalry enter the rear of the farm with a unit of artillery and infantry moving up in support. Meanwhile their artillery on the hill continue to engage the exposed Turkish infantry. Turn 7. 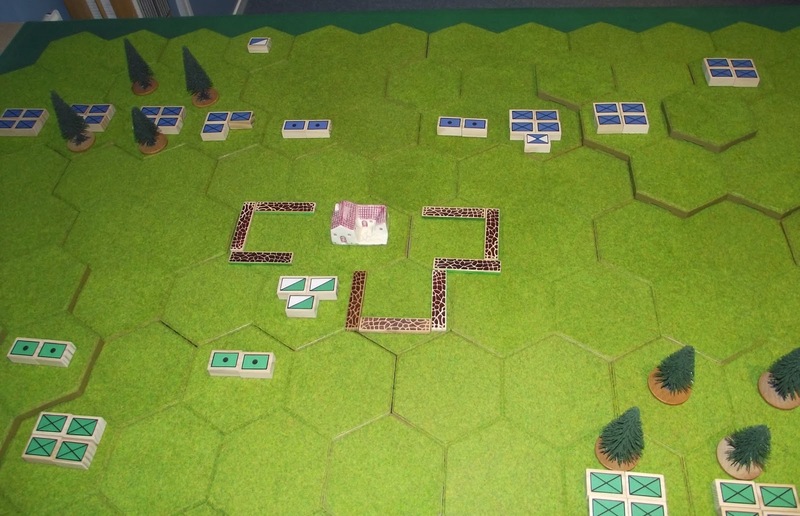 The Russians look to consolidate their position in the farm whilst the Turks move into position to mount a somewhat disjointed counterattack. Turn 9. 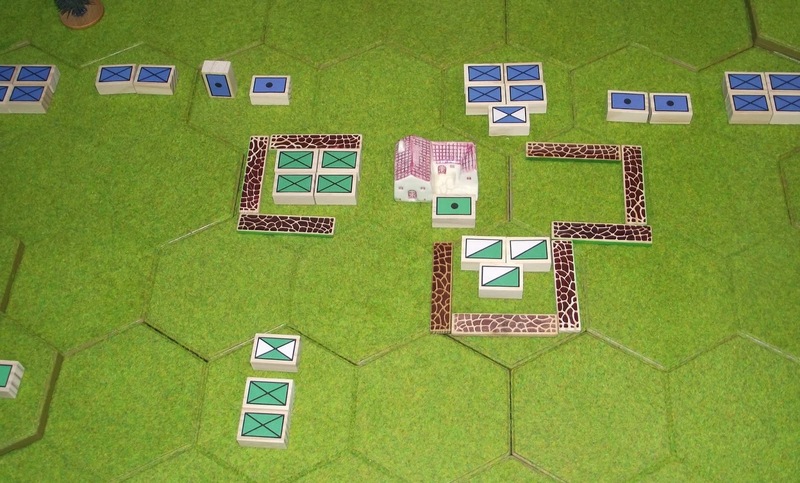 Meanwhile the Turkish infantry flood into the farm - straight into the maw of the Russian artillery. A furious hand to hand struggle ensues with the Turks managing to destroy half of the enemy guns. Their success is short lived though as a fresh Russian infantry unit arrives in support and with a crashing volley destroys the remnants of the Turkish infantry. The farm is, for the moment, still in Russian hands. Turn 10. The Russian infantry pour into the farm and immediately engage the Turkish artillery from behind cover, silencing half the battery. Meanwhile though, the Turkish attack is preparing to go in. Turn 11. On the Russian left a series of crashing volleys decimated the advancing Turkish infantry meaning that their attempts to support the farm were doomed to ignominious failure. Turn 12. The fighting in the farm was brief but vicious. The Turkish infantry with their commander roared in to the farm and drove off or destroyed the cavalry unit, the infantry and the remaining artillery, enabling the Turkish guns to move in. The farm was now under Turkish control! Turn 13. Endgame. The Russian right attempted to drive the Turks to their front away in order to support the renewed assault on the farm now in the hands of the Turks. 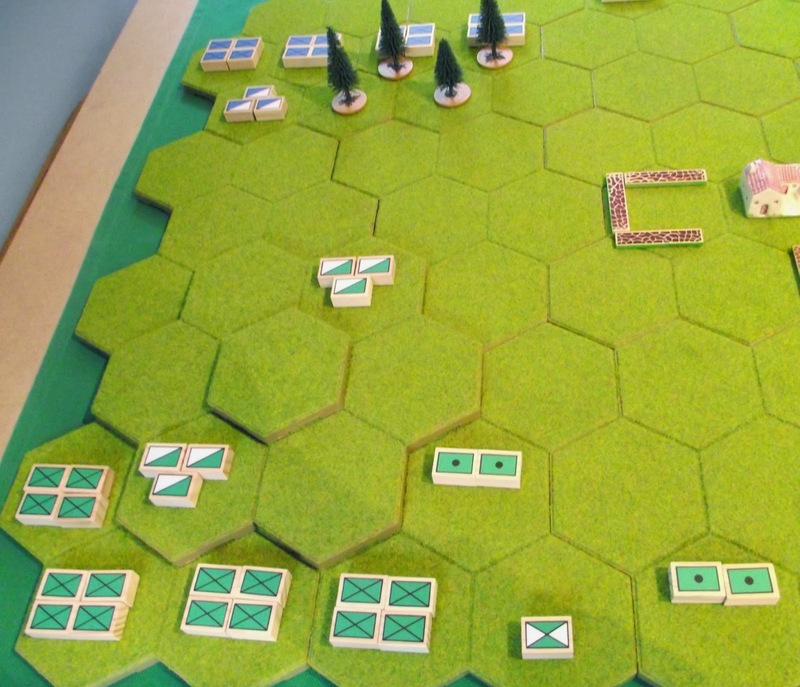 As they left the cover of the wood the Turkish cavalry crashed into their extreme right flank and despite being driving the horsemen off with losses they still sustained some damage. A ferocious firefight then broke out with heavy losses on both sides just as the final attempt to take the farm from the Turks was made. 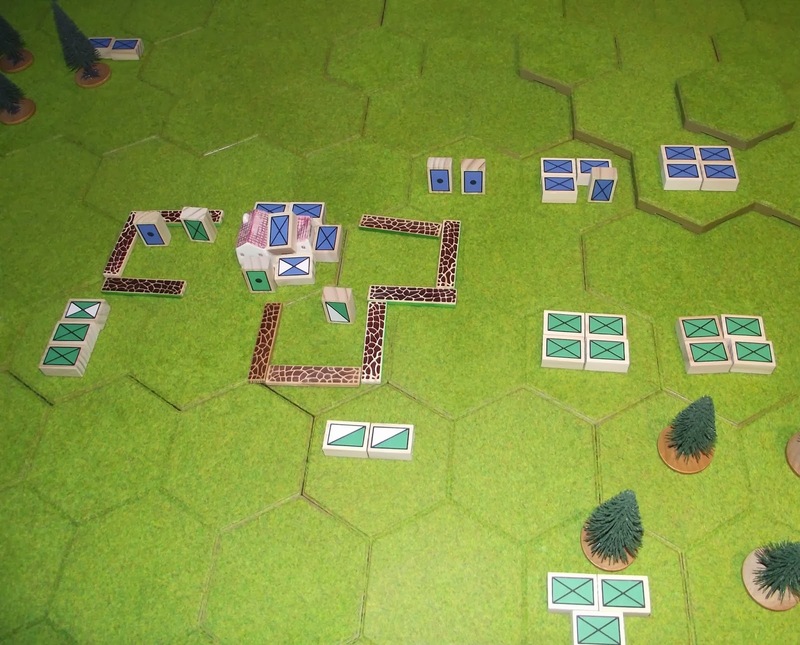 Despite gallant efforts the ensuing melee inflicted losses on both sides but the Russians could ill afford them and so the commander fell back. However, the Turks had reached their exhaustion level (26 strength points lost) whilst the Russians were still in fighting trim (only 17 out of 19 permitted). The Russians had carried the day! Well I have to say that my first game of the year was a rather enjoyable affair and I was rather pleased with the way the rules worked out. I needed to add a few things in but the core system was elegantly simple - no surprise given its inspiration. 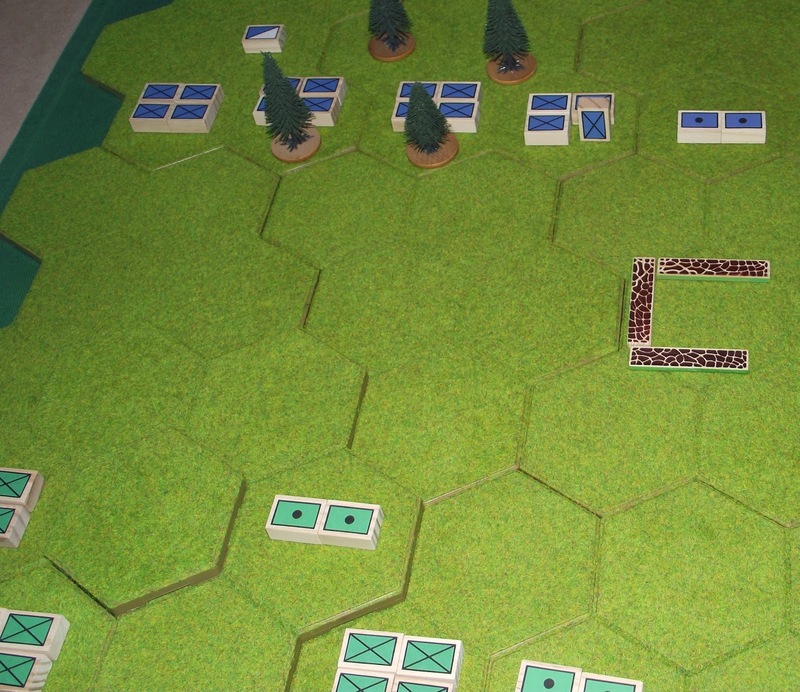 The only change I would make would be to allow infantry to move 2 and not battle as the movement was rather sedate. 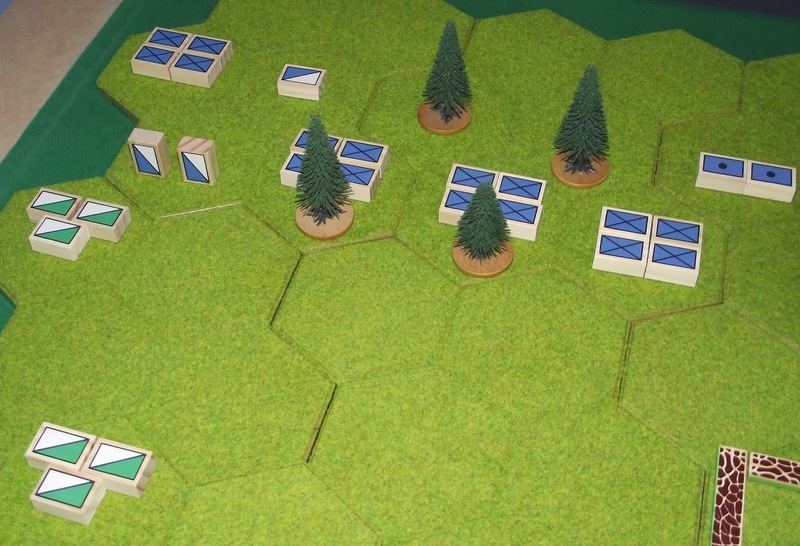 For the record I added in the 'battle back' facility for units in adjacent hexes that are still standing after combat, the previously mentioned deployment system and rules for terrain and cover. My feeling is that perhaps the game I played was slightly on the ambitious side for the rules as these were designed for use on an 8 by 8 square grid. It felt quite slow and deliberate for the infantry which would perhaps be better for the 18th century rather than the next. This is by no means a criticism though - they played as sweet as you like. At last! The revitalised man cave is now officially open for business. The last of the bits and pieces that needed putting away are now safely in deep storage and what is left is now a much more spacious set up then previously. The main part of the library is now along one wall with my folding 6 by 4ft table stored with a pair of 3 by 2ft boards in the top left corner. The table you see in the centre is 5 by 3ft and has plenty of space all around it (you can see this better in the next picture). Note the CD storage rack at the top of the radiator on the right - it is one of a pair and I plan to have a bridging shelf between the two over the radiator for some extra usable surfaces. The change around took me rather longer than I expected but the end result is definitely worth it. Once I have the radiator bridge in place I can redeploy some of the items dotted around so the space will seem even more, well, spacious. 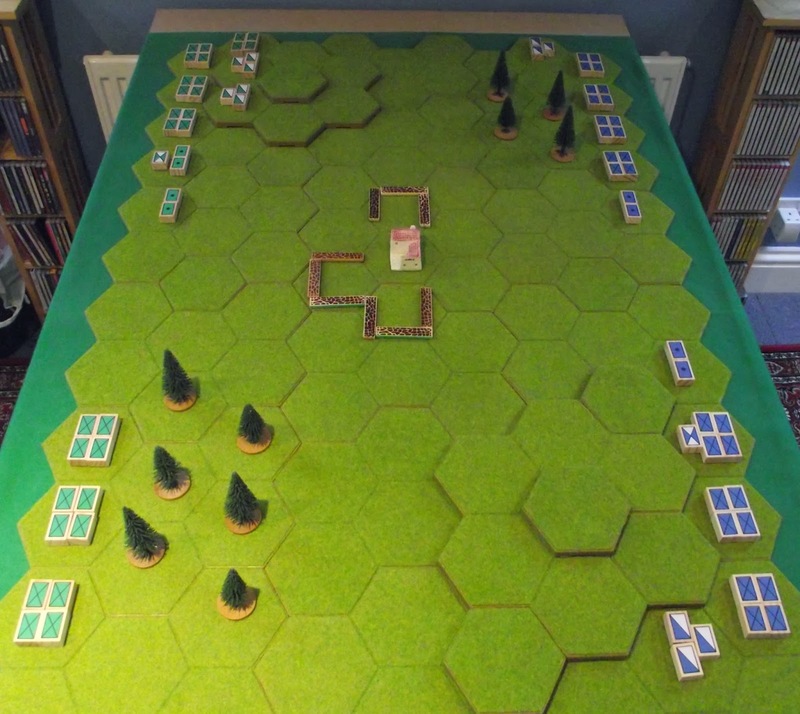 The view from the opposite corner - taken with my back to the stored playing boards seen in the previous picture. The space around the table can now be seen much more readily. You can see the CD storage towers at either end of the radiator and why I shall bridge them - it will give me another flat surface for 'stuff'. The doors lead into the roof eaves and we also have them on the other side. The loft access is just behind the electric fan. We also have two windows in the roof so in the summer these are often opened to allow fresh air to circulate. The main bulk of the man cave refurbishment has been completed. All that now remains is for me to put a few bits and pieces away and hoover the carpet and rug and I shall be back in business. By far and away the most laborious part of the undertaking was tackling the bookcases. I had to empty three, disassemble two plus a storage unit and then replace all the titles taken off the shelves. It was not difficult, just time consuming and hard work. I am really pleased to have done this though and the end result will mean a lot more floor space so deploying the 6 x 4ft table will be a doddle. The man cave in its original set form (the action was fought against Bob Cordery and was from the Russo Turkish War) with the books along the end wall. These are now where the cupboard is and will be extended by an extra bank taking the case into the top corner. The left hand unit of the book case in the picture will be disappearing to accommodate the extension. The roof in question is my own where the man cave is located and the Angels refer to my collection of 15mm WW2 aircraft for use with Angels 20. I have started to reorganise the man cave for what I hope will be the last time. The most significant change will be with the book cases. At the the present time I have two double units (I use the Ivar range from Ikea) facing opposite each other. The plan now is to turn one of the doubles into a treble sized unit and then have the single - with an extra shelf - deployed elsewhere. This will give me sufficient space to be able to deploy my 6 x 4ft table with plenty of floor space around it. I have made a start on the changes needed for this but to be honest, gave up after an hour or so as I am still feeling a little lethargic and unwell. Now that I can see what I need to do though I am confident that once I am back firing on all cylinders it will nt take long to organise properly - perhaps a day at most. Next after this will be the final block units and then the 1/2400th WW1 ships. FW 190 - because I can! Mention of Angels 20 (and the recent acquisition of the extra aircraft in the shape of four German FW 190 A fighters) has reminded me of a rather interesting development spotted by our very own 'Le Renard Subtil) - Mr Fox himself. He mentioned in passing about a new Yahoo group he had come across called Angels 21 and was getting in quite a lather about the same. I took and look and could see exactly why he was getting so excited. The group's founder has taken the game apart and made it a much more sensible 'beer and pretzel' game - sensible as in feels more like an aerial game then the original version) - and has come up with a heap of additional aircraft charts. After some initial problems I was able to download everything from the files section and am now busily digesting the same and how I can make use of this marvelous adaptation. I can see some serious fun with this - there are no 'special' abilities for one thing - and it has made me think about the possibility of using an alternate scale of models. It currently seems that a third set will not be produced so it would mean adding extra models from alternative sources which could be potentially quite expensive. One to ponder for the future methinks - once everything else has been attended to, starting with the man cave. 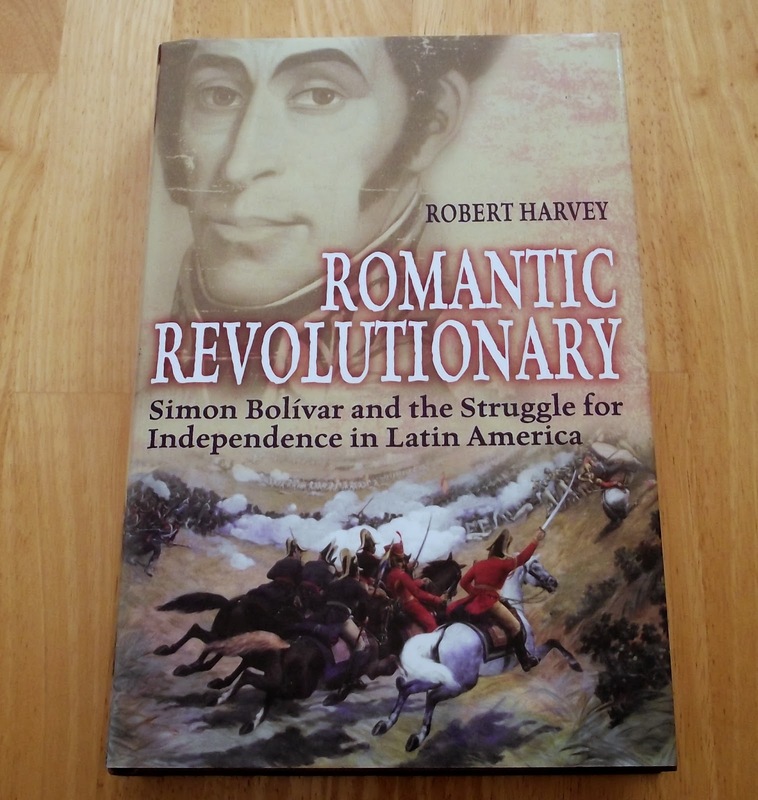 ....Which is of the course the title of Robert Harvey's biography of Simon Bolivar and his role in the Latin American struggle for independence against Spain (ISBN 978-1-84901-354-3, published by John Constable). I was not looking for this book - I already own a biography of Bolivar and also the authors excellent title concerning the campaigns of the major personalities: Liberators - but managed to acquire a hardback copy for a mere £5 earlier today. I mentioned in my previous post that I was feeling pretty unwell with a stinking chesty cough and cold with a sore throat and that wonderful cotton wool feeling in the head. I had been at work all this week, struggling on (and trust me, making umpteen phone calls a day when you can barely speak is a challenge!) until this morning when I finally decided enough already and came home. I decided to pass by a discounted bookshop in the city on the way to the station as I knew I had a bit of a wait until the train home was ready. I went in and lo and behold, there it was, the last copy! I was really pleased to land this although it has been rather battered in terms of reviews on Amazon by readers far more knowledgeable than I am. I must confess to enjoying the authors style of writing (his biography of Clive of India is very good) so will probably like it despite its faults. My library on the wars of independence in Latin America is growing and so the need for me to think about this from a gaming perspective has just crept up a notch - as has the need to finish the musket era adaptation to Bob Cordery's 'Itchy and Scratchy' rules. It is funny though, how an unexpected bargain can work almost as a medicine when one is feeling under the weather! On the plus side though, I took delivery of four Axis and Allies Bandits High 15mm scale FW190 fighters in a rather fetching Luftwaffe desert colour scheme - identical to that in the picture above sans the tail markings (not PC apparently....). Despite having an aerial mountain of unpainted aircraft I was really pleased to get these for a number of reasons. Firstly, the FW190 is a very good aircraft and in all the aerial wargames I have played it is, quite rightly, a formidable opponent. Secondly, it just looks menacing, in the same way a Tiger tank does. With the model in the same paint scheme as the picture above (minus the markings already noted) I figured that some research was in order and I was delighted to find out that the FW190 served very effectively in North Africa - both as a fighter and as a fighter-bomber. The aircraft was deployed from November 42 to May 43 and was in action against American, British and French aircraft over Tunisia. A result of this research has made a decision for me in that I am going to paint all of my German fighters in a tropical desert scheme - Bf109 Es through to G and also the redoubtable FW 190. The Battle of Salamis - with a little artistic licence re the sails which would normally be lowered or even left on shore. Way back in the first half of last year I was mooting the possibility of tackling some ancient galley action in conjunction with the appropriate parts of Command and Colours Ancients. My period of choice was going to be the Greek and Persian Wars and this was inspired by the acquisition of Richard Nelson's books on Salamis, Warfleets of Antiquity and his hex based fleet action rules published by WRG. My thoughts initially were to use a more detailed set of rules than those published in his book on Salamis but now I am not so sure. 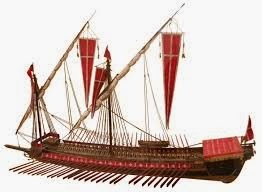 My original post More on Ancient Naval Warfare Rules outlined some of my thinking but as I am now looking to include the naval side in the campaign as a whole (which I am sure you do not need reminding included Thermopylae and Plataea). Richard Nelson includes rules for handling the Persian invasion on a strategic level which could easily be translated into Command and Colours forces as well as the fleets involved. It would not need a huge amount of work to get ready - in fact the only issue I currently face is painting the 60 odd galleys required. I am looking to tackling this as the land side has always interested me and so having both elements available to game would tick a number of boxes. First of all a very happy new year to one and all! Following on from my previous post I had a few spare moments today to sit and think about what I wanted to do this year. If you recall I had pointed out that any projects needed to be small, self-supporting and resourced from my existing collections. My gaming needs for the year will have to be modest in respect of any expenditure as although I am working my disposable income is a pale shadow of what it used to be - this is not a bad thing though, not by any means. Making a virtue of necessity means that I have to really concentrate on what I want to do and how any funds can be applied. This is a challenge I enjoy and it makes the haunting of charity shops and boot sales even more essential! So, despite the austerity measures currently in place what do I have currently on the plate to consider for the coming year that will need any expenditure (and I am not including materials such as paints and glue etc)? Ancient Galleys - My current plan needs another dozen or so 1/1200th Triremes which will give me sufficient models to replicate the fleets at Salamis as per Richard Nelson. These will be Navwar models and as they come in packs of two the cost is very modest. Renaissance Galleys - At this stage this, along with the ACW collection described later, will probably be one of my biggest model purchases of the year as My current plan envisages around fifty models. These will be from Navwar. 1/100th WW2 Aircraft - I actually do not need many more models for this and the painting backlog I have with those models I already own is more than sufficient to keep me occupied! I will need to source some decals though. 42mm Plastic WW2 - This is a tricky one as I have the infantry I need (although some support weapons would be nice) but I am a little undecided as to how I want to progress this. I need to give this some careful thought. Space ships and Robots - Something a little different but one that I will enjoy. I have all the material I need at present but expect that some additional bits and pieces may feature in due course. In respect of what I have that I do not intend spending anything further on then the 1/2400th WW1 ships models take centre stage. I had hoped to add some other models to complete the collection but am now not going to bother so the navies of both Fezia and Rusland will have to make do. Trust me, this is rather a lot as well! The plastic pirate ships will also be featuring at some point although I am unsure about what I shall be using them for at this stage. 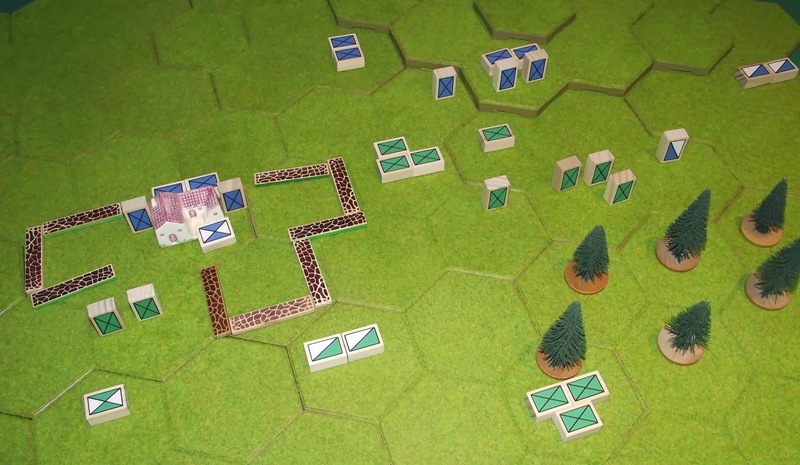 I have some ideas to play around with (and using the block armies) for a number of mini campaigns - some of which have been mentioned in recent posts - and I want to spend some time formalising the process for handling these. 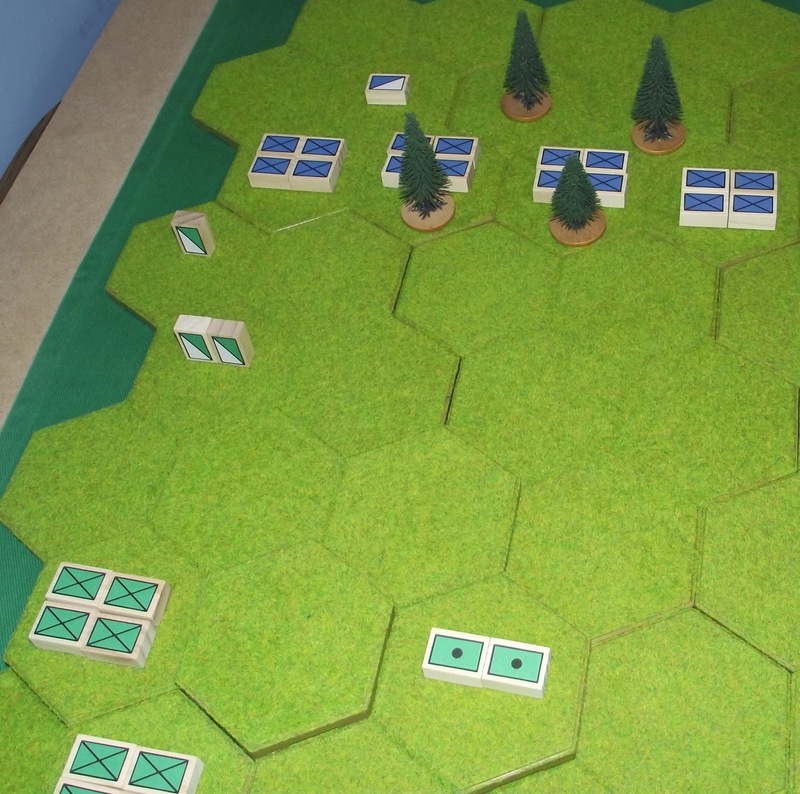 My current thinking is to have a scenario requiring from three to five linked games over an area equal to nine standard playing areas (in each case a 13 x 9 hex table). This idea is still in the planning stage but I will post once it has developed further. One thing I must do though is to make sure that my blog reading and comments are rather more speedy than they have been - the same applies to emails. I recently changed my mobile phone and hooking this to my email accounts has caused me a number of teething issues. This has now been resolved but I have managed to delete vast chunks of old emails so if you have contacted me over the last month and have not seen any replies you may have been caught up in the technological maelstrom for which I apologise. It is all OK now though. Once again then, a happy new year to one and all!